Our new corporate website www.spendmap.com came online yesterday. 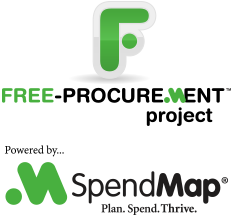 Many hyperlinks in your free version of SpendMap will now be broken. You can wait for the next automatic update (could be up to 7 days) or you can select HELP > CHECK FOR UPDATES from the Main Menu to update your system immediately. In addition to a fresh design and updated content, the new website now incorporates The Free-Procurement Project into our core SpendMap brand. I’d like to make a special shout-out to the team at i4 Solutions who I think did a great job on the site and were wonderful to work with during the whole process. This is the second project we’ve done with i4 and I’d recommend them for website design and web-based application development. I’d also like to thank Jeremy Miller at Sticky Branding for his advice at the outset of the project (the Free project, not the new website). While we didn’t formally engage Jeremy on this project, we appreciate his generous advice and encouragement as we set out to learn about social media marketing and organizing large groups of people. Thanks Jeremy!